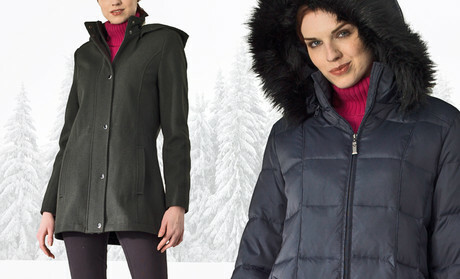 Nautica’s down- or wool-blend women’s coats offer fashionable protection from cruel winter winds. Faux-fur-lined hoods provide warmth and glamour, and the wool-blend anorak’s cinched waist maintains hourglass shapes like a determined glassblower. Both coats feature side pockets for storage of keys, cell phones, and snowballs.